Please Note: While Cathy is on Sabbatical, Louise is writing all the reviews. Cathy will return February, 2018. 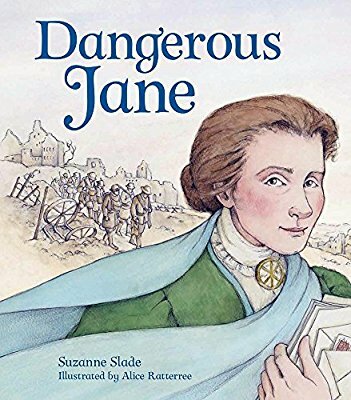 Suzanne Slade has penned a picture book biography on the life of Jane Addams, known as a pioneer in social reform. Addams is best known for her creation of the settlement house, Hull House, where she lived and worked until her death in 1935. After graduating from college and enjoying the luxury of traveling abroad, Jane, again, encounters poverty. She saw starving people spending their last pennies on rotten vegetables.” Her idea of buying a big house returns. She visits a settlement house in London named Toynbee Hall which helped poor people help themselves by providing skills, confidence, and the dignity to start a new life. In 1889, Jane Addams founded Hull House in Chicago. Working eighteen hours a day, she provided whatever her neighbors needed: English lessons, childcare, wash tubs, steady work. But most important, she gave friendship, dignity, hope. During World War 1, Addams and 1500 women form the Woman’s Peace Party, an organization that promoted world peace. In 1931, Addams was the first American woman awarded the Nobel Peace Prize. Retterree’s full-page watercolor illustrations complement the text. I am of the mindset that no book is too young for any audience. Sometimes, a picture book biography is perfect to use as an introduction with older students, middle thru high school. Back matter includes an author's note, timeline, a selected bibliography, and source notes for the quotes. Share this books with students and they will find out why Addams was labeled, Dangerous Jane. An important historical figure to remember. I reviewed this book using an Advanced Readers Copy (ARC) sent to me by the publisher.